Welcome to my Fortnightly Market Update, which will give you insights into trading, education and tips for trading success. This week’s hot topic is about a concept that is often misunderstood – Passive Income – people often mistake a passive income, as only being a secondary income, it is however much more than that. If you have any questions on the below do not hesitate to contact me directly. • Active Income (or an Earned Income) – This is where you are working for money. The traits of an active income is the cost of time. You must trade time (which for most of us is a limited resource) for money. Once you stop working, the income that you receive will also stop. • Passive Income (or a Residual Income) – This is where your money is working for you. It is basically the reverse of an active income. When you stop working and spending time on this income it won’t necessarily stop. As you can see above there are multiple ways of making different passive incomes and each require more or less of your input and time: investment earnings, along with royalties and patents require the least of your time and effort for the income received. 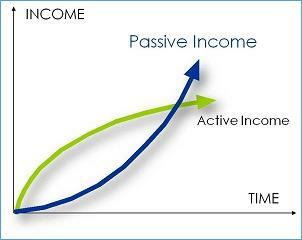 Why is a passive income so important? How many more hours overtime can you work per week without burning out? How many times can you negotiate your salary upwards? The key to passive income is finding something that will continually provide income on an ongoing basis for the least effort possible. After all time is money, the more free time you have – the more money you can make. How much time do you spend creating a passive income? Do you even yet have a passive income? If not, when are you going to start creating a passive income? How can you make a passive income through trading? At Learn to Trade we teach a way of trading called End of Day trading. The means that you only need to look for and place trades after 9pm UK time. We are basically waiting for the Daily Bar to close at 9pm and then our software can determine if a trade setup has occurred or not. The software finds all of the trade setups automatically for you so that you can place the trade. It only takes a maximum of 30 minutes each evening, the markets are open 6 nights a week’s meaning that you will only be working for 3 hours per week. So what happens next? Do I have to watch that trade? Nothing, when you place your trade everything is fully automated. Once you spend 30 minutes finding and placing that trade, you walk away and your money will be in the market working for you – while you sleep, go to work the next day, play golf etc.